Those awaiting results of April 2015 Librarian board exam may find here the alphabetical list of passers, top 10 (topnotchers), top performing school and performance of schools as the Professional Regulation Commission (PRC) and the Board for Librarians released results in 3 working days after the exam. 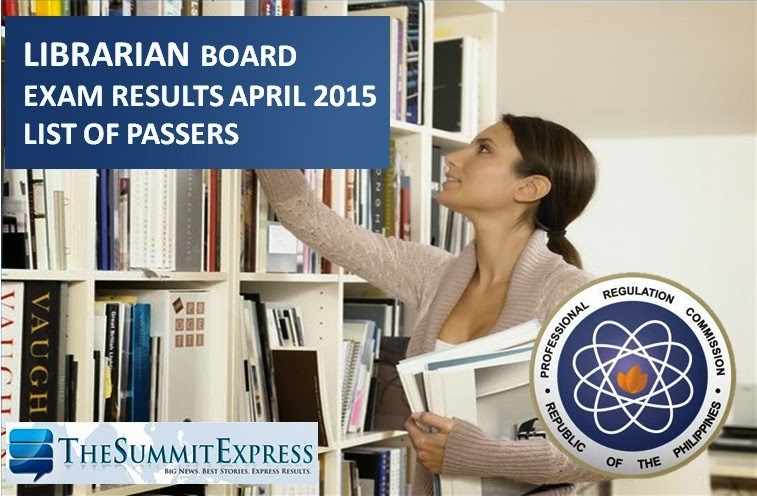 PRC on Tuesday, April 28 announced that 349 out of 742 passed the Librarian Licensure Examination. The Board for Librarian headed by Yolanda C. Granda with Lourdes T. David and Agnes F. Manlangit, Members administered the licensure exam on Wednesday and Thursday, April 22-23 in the cities of Manila, Baguio, Cebu, Davao and Legaspi. Librarian licensure exam covers the following subjects: organization, management and maintenance of multi-media based library or information service laws, trends and practices affecting the profession, reference, bibliography and information services and selection and acquisition of multi-media source of information (Day 1) and cataloguing and classification, indexing and abstracting and information technology (Day 2). Registration for the issuance of Professional Identification Card (ID) and Certificate of Registration will be on May 4 and 5, 2015. Those who will register are required to bring the following: duly accomplished Oath Form or Panunumpa ng Propesyonal, current Community Tax Certificate (cedula), 1 piece passport size picture (colored with white background and complete nametag), 2 sets of metered documentary stamps and 1 short brown envelope with name and profession and to pay the Initial Registration Fee of P600 and Annual Registration Fee of P450 for 2015-2018. Successful examinees should personally register and sign in the Roster of Registered Professionals. Like Us on Facebook, Follow Us on Twitter and subscribe to our email list to receive more updates for Librarian board exam.